Forget Valentine’s Day, February 14th is Library Lovers’ Day in Australia! So to mark the occasion (which internationally is a whole month), break out your book bags and head down to your local library! It might be a surprise but libraries have managed to stay with the times, on your trip you might find yourself marveling at all the new and wonderful resources.You might find a 3D printer, free wifi, a collection of eBooks and eAudio books, a larger collection of free to use resources such as family history access and not to mention a even larger number of books. In light of the day you might even find a ‘Blind Date’ book selection, whereby books are wrapped in brown paper and only small hints about the plot revealed. When you borrow your ‘date,’ you get a literary surprise when you get home. As a qualified librarian myself, you may say that I am unreasonably bias in the matter, but libraries have been around for thousands of years and will continue to stick around for even longer. So what are you waiting for? 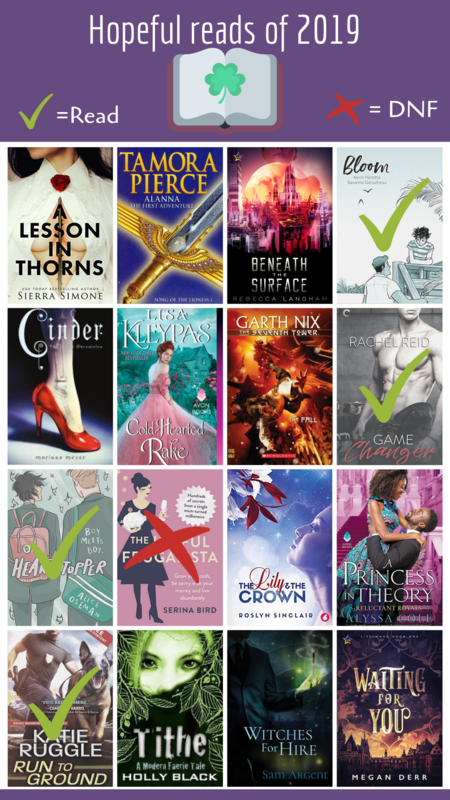 Go show your local library a little love! If you would like to know more about what your library can do for you, check out my post, Library Services and You or simply have a quick look at my Library Month event from 2014. You need to be open to change. As with anything if you’re not willing to change with technology and your industry, you’re going to get left behind. Early on in my course it become apparent that the library industry is one that has changed with the times, however it was not something that everyone has embraced. Therefore the need to not only change but to be open to it is needed within libraries as, as our patrons shift, so must we and the services we offer. Libraries are more than just books. The old stereotype of dusty libraries is a relic of the past, today you are more likely to see library space used for communal computers or study space. Modern libraries have embraced a range of technologies are offer a number of different services ranging from digital, social and educational. There are many different ways to search for information. Whether this is simply through a database, catalogue or simply on Google, there are many different ways to search. There are advanced search options in a large number of search functions that allow you to narrow down your search, using Boolean Operators will increase the amount of useful information returned. It is important to remember that not all of life’s answers are going to be on the first page of the Google results. When you think of libraries chances are you’ll think of books. This is by no means the wrong answer as for hundreds and thousands of years, libraries have been a ready source of books. However, as with everything, libraries have changed with the times and technologies. Such steady progression has seen many new features added to the repertoires of libraries, with new services being added and older one being updated. Digital music collections (often restricted to a number of downloads a fortnight). Online access to newspapers and their archives. Family history services and specific website access. Nation wide inter library loans. Cultural collections (digitised or physical). Prints of images from the collections (eg Fie arts prints). Some libraries also have on site cafes. These new and evolved services are purely examples, with each library and its offered services being different. Although why certainly, some libraries may have all of these services, others may only offer a few of them. In addition, the existence of special libraries which house more focused and subject based collections, has opened up an even larger opportunities for library users. Where before you would have to physically travel to a special library collection, or have the information scanned and sent to you, the digitalisation of special library collections has meant that you can now access the resources online. Just as the creation of the Internet and the World Wide Web has revolutionised the way in which we live, so too has it greatly affected the services that libraries can offer. So next time you think about purchasing an eBook, or buying a magazine subscription, why not check out your local library and see what they have to offer. Libraries represent a world of open opportunities, the ability to not only learn but to immerse yourself in any number of worlds fictional or not. The library is a magical place and often it is within fictional worlds that this is demonstrated the most. Fictional libraries are often depicted as either realistic spaces in which characters retreat to learn or they are majestic and magical beings. The libraries that are featured within this list have been taken from a number of sources, ranging from films, television shows, books and even poetry. The libraries discussed within are huge and humble, magical and mundane, but what they all have in common is they all have a powerful presence. The libraries within this list all represent what is so wondrous about books and the libraries that house them. However, as with modern libraries, books are not all that lie within their shelves, there is so many possibilities within the buildings themselves. It is this potential that often sees fictional libraries held at a highly esteem, often at a magical and other worldly level. So without further ado, here are my top five fictional libraries. 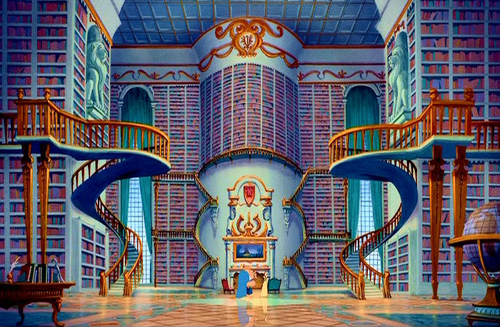 • Coming in at number five is: Belle’s Library from the Beauty and the Beast. 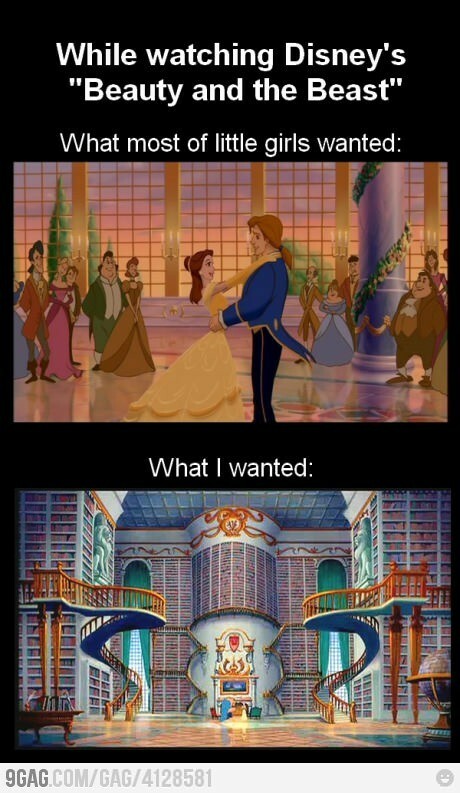 The library that The Beast presents to Belle is not only large but it is so incredibly beautiful. Within its walls are writing space, a fireplace and numerous spaces to just sit and read. The shelves that reach to the ceiling and the three levels and staircases used to access the books are so stunning. The amount of natural light and the soft blues of the decorating all combine to create a simply beautiful library. The fact that is a private, albeit royal, library makes it even more amazing. There is a wonderful meme floating around that follows that while some children wanted the Prince, the library was what hooked people. For me, this could not have more true. While the film was not my favourite Disney film growing up as a child (Little Mermaid has that honour), Belle was the character I was most drawn too. ‘Her nose stuck in a book’ is something that strikes very close to home for me, so naturally the revelation of such a massive and beautiful library is one that created envious feelings. Indeed, in the idea of my perfect house, a library such as this was, and I will admit still, features quite heavily. • In fourth spot is The Fantastic Flying Books of Mr. Morris Lessmore. The 2011, American short film tells the story of Mr Morris Lessmore as he finds and interacts with a magical library of flying books. Directed by William Joyce and Brandon Oldenburg, the film demonstrates the powers of not only books but that of storytelling. The Academy Award Winning piece is one that has made it onto this list because of its adorable depiction of a library populated by flying books. Mr Morris, transported to the mysterious world by a hurricane, looks after the needs of the flying books all the while writing within his notebook. A lovely part of the short film is when other people of the world visit the library and take home a book; they go from being black and white characters, to multi-coloured, fleshed out ones. The books within the library literally colour and illuminate the people who read them. It is often the contents of a library that defines it, just as a special collection can become a defining feature of a library, so too is Mr. Morris’ library defined by its adorable flying books. • Coming in at third is: The Library from Doctor. Who. In episode eight of the fourth season, the Doctor (David Tennant) and Donna Noble (Catherine Tate – who I would argue is the best companion – please don’t kill me Dr. Who fans) visit the greatest library in universe. Within the planet sized library is a copy of every book ever created; in addition to the largest hard drive that holds not only the index of the library but a digital copy of every text. The sheer size of the library grounds is only trumped by the rich story telling that happens within the many library buildings. Without giving away the whole plot of the episodes, the library is not only a glorious one but it is one that holds many secrets and dangers. The library is the largest in the universe, boasting a copy of every text ever created but it is also strikingly beautiful. 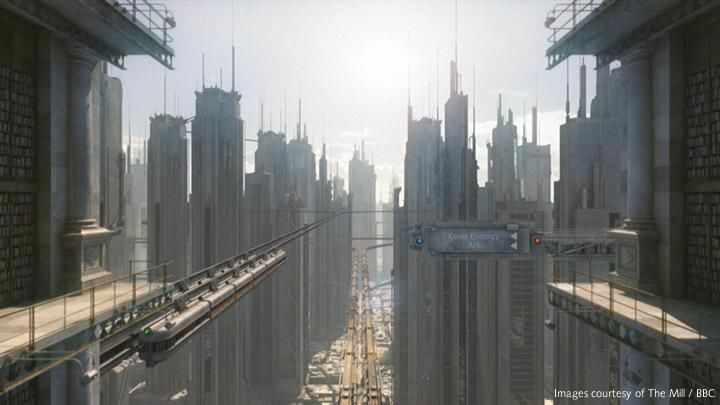 Within many fictional library representations, the buildings themselves are described and represented as things of great beauty. • In second place is the rather unusual, Library by Albert Goldbarth. More of a metaphysical library than a ‘real’ fictional library (if you can even claim such a thing) the library in question is comprised simply of lines from a poem. Each sentence within the list poem, Library, begins with the line, ‘This book.’ Following this repeated line are a wide range of sentences that describe an even wider range of, one hopes, non-existent books. Each line and each new book described within the poem are what are used to create and make up the library of the title. The very first line of the poem starts off as, ‘This book saved my life,’ and then continues to list many other books. The books included within the poem and ‘library’ range from the humourous (‘This book smells like salami’), to narrative based snippets (‘This book I stole from Cornell University’s Olin Library in the spring of 1976. Presumably, its meter’s still running. Presumably, it still longs for its Dewey’d place in the dim-lit stacks’), to the downright beautiful (‘This book poured its colours into my childhood so strongly, they remain a dye in my imagination today’). Not only is the poem an enjoyable read but each individual book and snippet featured within the poem are enough to create an immerse and diverse library. • In first place is The Great Library featured within the Thursday Next books by Jasper FForde. 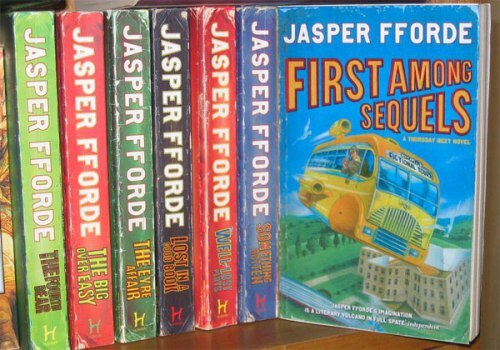 Jasper Fforde’s Thursday Next series is an experience. The word creation and depth that the stories create is staggering. Set in an alternate universe, the protagonist Thursday Next finds herself at the mercy of a number of fictional issues. The whims of a villain, issues concerning space and time and the need to police the literary world are only the tip of the iceberg that is the world Fforde has created. Within this entire universe however is the Bookworld and within this world is The Great Library. What sets the Great Library apart from other fictional libraries are the lower 26 levels. This area is known as the Well of Lost Plots and is where the unpublished manuscripts are kept. The abandoned novel of yours hidden safely away in your bottom drawer is in fact a living breathing world, occupied by the characters you have created. Not only does the library house this special collection but it often serves as the base of operations for the JurisFiction. The operation and operatives, Thursday Next herself included, police the activities and narratives of literature, making sure that plots are not changed and characters continue to perform their proper roles. Not only is the Great Library number one on the lost but the entire series comes highly recommended as they are all highly entertaining and vastly imaginative reads. The libraries featured within this list are all ones that embrace the importance of libraries, with each one displaying different nuances of the purpose of libraries. Where The Fantastic Flying Books of Mr. Morris Lessmore shows the transformative powers of libraries, Goldbarth and Fforde show the playfulness of such sites, indeed the Doctor Who library shows the immersion that can occur within library walls. However the libraries within the list exhibit a certain beauty and majesty which, seen primarily in Belle’s library, is something that all the fictional libraries within the list share. Just as libraries hold an important place within fictional works, so too do libraries hold a significant and important place within the world today. Honourable mentions: The Pagemaster, Harry Potter, Unseen University Library from the Disc World series. A short little fake promo. Enjoy. As a child, I remember the moment I got my very own library card. Until then I had been piggy backing off my Mother’s card but it wasn’t until I got my very own card that I truly felt in control of my own borrowing. The card was still kept in my Mother’s wallet but I could still walk up to the counter and the nice librarian could scan the books for me. I don’t think we should ever forget the power of a library card. For a child, at least in my own experience, it was like opening up a whole new world of possibilities. No longer was my hand being held through the library, as I finally had the power to choose and consume the knowledge in the books I had borrowed all by myself. Still to this day I remember my library card number, rather than that of my license or credit card number. I feel that just like the power of the library card, the library itself is still a important and powerful part of society.